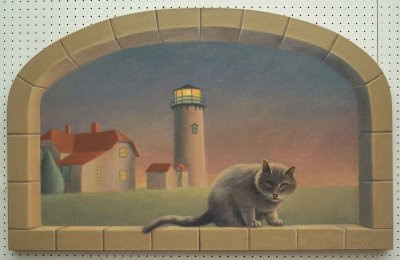 Although our cat Ritty had never visited the Chatham light house, in 2007 he posed for a photo, used in this painting. 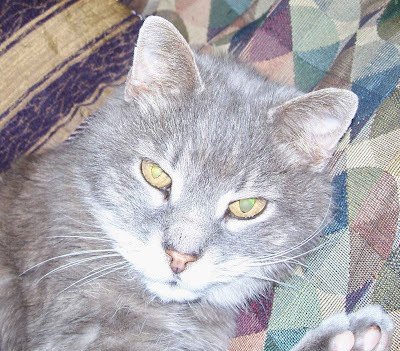 He was a very old cat here, and little did I know he would leave us in a year's time. Gail adopted him from Grandma Gloria. He enjoyed eating mice and chipmunks. Legend has it that in his prime, he killed "Shadow" in Euclid, Ohio. He lived out his elder years in Twin Lakes, lounging on the deck sporting a harness. Ritty passed away on June 23 at 12:30 PM. He was 22 years old. His human family and friends will all miss him.